We have been taught that a high rate of return requires that we take greater risks and the way to manage that risk is diversification. This is flat wrong and detrimental to our wealth. How can such a widely held view be wrong and if it is what is the correct view? The answers are at the heart of value investing and come from some of the most successful investors in the world. By studying great investors we can learn important lessons about how to build long term wealth. Risk is most often defined as the volatility of a particular investment; how widely the price of a stock, for example, changes in a given period of time. So, if the price of a stock changes wildly from day to day and we need to sell it tomorrow for some reason; we are taking a risk because we really don’t know what the price will be tomorrow. If the stock is up in price we win or down in price we lose. However, the real risk is in the timing of the sale not the volatility of the stock. Without a time constraint we could just wait for an up day before we sell. Volatility may define risk for someone required to sell at a particular time but not for a long term investor. For the investor the true definition of risk is the potential for permanent loss on our investment. Warren Buffett described risk in the 1993 letter to Berkshire Hathaway shareholders; …we define risk, using dictionary terms, as “the possibility of loss or injury.” Academics, however, like to define investment “risk” differently, averring that it is the relative volatility of a stock or portfolio of stocks – that is, their volatility as compared to that of a large universe of stocks. Employing data bases and statistical skills, these academics compute with precision the “beta” of a stock – its relative volatility in the past – and then build arcane investment and capital-allocation theories around this calculation. In their hunger for a single statistic to measure risk, however, they forget a fundamental principle: It is better to be approximately right than precisely wrong. He continues a little later…For owners of a business – and that’s the way we think of shareholders – the academics’ definition of risk is far off the mark, so much so that it produces absurdities. For example, under beta-based theory, a stock that has dropped very sharply compared to the market…becomes “riskier” at the lower price than it was at the higher price. Would that description have then made any sense to someone who was offered the entire company at a vastly-reduced price? In fact, the true investor welcomes volatility. Ben Graham explained why in Chapter 8 of The Intelligent Investor. There he introduced “Mr. Market,” an obliging fellow who shows up every day to either buy from you or sell to you, whichever you wish. The more manic-depressive this chap is, the greater the opportunities available to the investor. That’s true because a wildly fluctuating market means that irrationally low prices will periodically be attached to solid businesses. It is impossible to see how the availability of such prices can be thought of as increasing the hazards for an investor who is totally free to either ignore the market or exploit its folly. If we accept the potential for permanent loss of capital, not volatility, as the definition of risk we can turn other widely held investment concepts on their head to our advantage. That is provided we have the discipline to do so. financial goals because they fail to exercise discipline. This is especially true during volatile markets. during the period it was managed by Peter Lynch. Peter Lynch ran the Magellan fund from 1977-1990 delivering an outstanding 29% average annual return during his tenure. Despite this outstanding performance Fidelity found that the average investor in the fund actually lost money during this 13 year period. According to Fidelity, investors would run for the doors during periods of poor performance (sell low?) and return after periods of good performance (buy high?). This behavior whether due to performance chasing, attempts to time the markets, fear or greed, affects the majority of investors. After a bad stretch with stocks investors often reduce their stock holdings or abandon them altogether. This often occurs at precisely the wrong time. History shows that investors should feel confident about the long-term potential of equities. It can be a bumpy road at times but the longer term is clear. 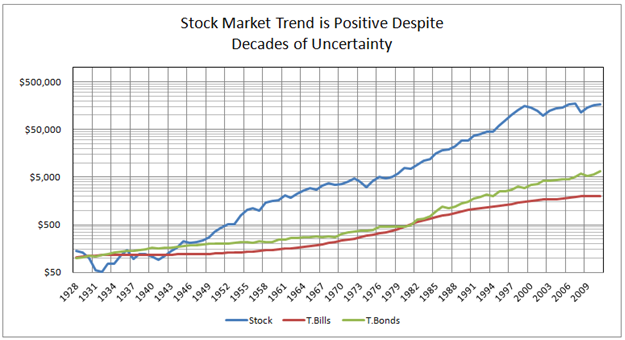 Compare the historical growth of stocks versus bonds or money market investments in the graph below. From 1928 through 2012 $100 invested in stocks Treasury bills and Treasury bonds would have compounded to $166,788 for stocks; $1,970 for Treasury bills; and $6,727 for Treasury bonds. It is clear to me where we should invest for the long term. When faced with market volatility however, many investors abandon their long term investment strategies to chase performance or try to time the market in some fashion. The impact is shown in the study results below conducted by DALBAR from 1987-2006; the S&P 500 index returned 11.3% annually while the average stock mutual fund investor earned only 4.3% per year over the same period. portfolio in 1987 would have seen it grow to about $23,000 over the 20 year period while $10,000 investment made in the S&P 500 index would have seen it grow to about $85,000 for a $62,000 difference. Professional money and mutual fund managers show many of the same behaviors. And the beat goes on; over the period from 1992–2011, the S&P 500 index returned 8.2% annually, while the average stock fund investor earned only 3.5%. 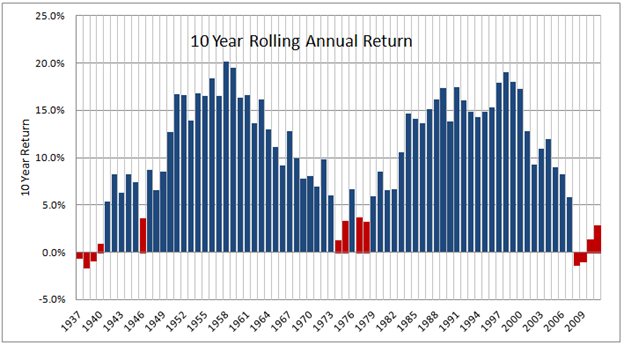 The chart below shows 10 year average rolling returns for the stock market from 1928–2011. The red bars represent 10 year periods where the market returned less than 5%. There were thirteen 10 year periods where the market returned less than 5%. In every case the periods following produced better returns. The periods of recovery averaged 13% per year ranging from a low of 7% to a high of 18%. Unfortunately after a period of underperformance investors are disappointed or fearful. They move out of equities and miss the attractive gains that tend to follow for years to come. The key to unlock these tenets for our benefit is Intrinsic Value. Intrinsic value is the measure of the underlying economic value of a business regardless of what the stock price happens to be. Intrinsic value enables us to do our job in a disciplined manner. It is how we know if we are taking advantage of Mr. Market; if we are buying the business at a discount to its true value and how much we reduce risk by building in a margin of safety. Remember price is what you pay and value is what you get. Without knowing the underlying economic value of the business we are just guessing if it is a good price. With intrinsic value in hand we can determine quantitatively if we are buying a business from Mr. Market at a sufficient discount or margin of safety. The margin of safety is needed to cover the potential errors we will make in estimating intrinsic value or unforeseen changes in the business. Eventually the stock price will approach the intrinsic value of the businesses we own and then we may sell, we may not know exactly when, but it always happens. When the market is high it is hard to find companies on sale (when compared to the intrinsic value); so we buy less, as it should be. When the market is low many companies, even great companies, go on sale so we buy more, as we should. The stock price vs. intrinsic value of the business is the key, not the market forecast or someone’s guess on what might happen in the economy. At times we just have to wait patiently for the opportunities, sometimes for a long time while we accumulate cash. That’s how we buy low and sell high. value allows us to make Mr. Market work for our advantage. It instills the discipline and risk management so often elusive to the investor. The information contained herein is provided for informational purposes only, is not comprehensive, does not contain important disclosures and risk factors associated with investments, and is subject to change without notice. The author is not responsible for the accuracy, completeness or lack thereof of information, nor has the author verified information from third parties which may be relied upon. The information does not take into account the particular investment objectives or financial circumstances of any specific person or organization which may view it. Nothing contained within may be considered an offer or a solicitation to purchase or sell any particular financial instrument. Any investment can be very risky and is not suitable for everyone. You should never enter into an investment unless you can afford to lose your entire investment. Always complete your own due diligence. Before making any investment, investors are advised to review such investment thoroughly and carefully with their financial, legal and tax advisors to determine whether it is suitable for them. Copyright © 2012 Provalum LLC. All Rights Reserved.